Wooden / Steel Anvil Stand - The Iron Forge Fire Blackmithing Forum. I decided to build a Wooden Anvil Stand, a stump, a large single piece of dimensional lumber or just some scrap pieces of construction cut off lumber ! Because of the large number of building sites around my area I chose the cut off lumber and was lucky enough to find 2 x 12s, some 2 x 10s and my center core a 6" x 8" beam. I glued all of the pieces together, tighten up the through bolts, smacked the top of the stacked lumber with a large mallet to make sure things were as square as possible, and clamped the pieces together to wait for drying. Once dry and not unexpected, the block wobbled. I ran a straight edge across the top and bottom and started sanding... to say the least, it was a large undertaking; I needed some other way and found it on another site. Using a router and a makeshift jig I routed the top and bottom an almost flat condition, close enough or better than just glued and hammered. Here are a few pictures of the leveling process, not precision work but good enough. The beginning of the leveling process, glued, clamped, and through bolted block of construction site lumber. Here is the top after routing. The next two pictures are the finished wooden center of the stand and the top and bottom steel plates. Here is my Avatar, shows the unfinished wood stand with the PW on top. The new stand is taller allowing for less back ache, see the old one in front of the new stand. There are a few pieces of steel left to go on, some flat stock and home-made tightening clamps under the top plate and some corner edge pieces of angle stock. Also, a tool rack and 2x2 receiver, and things should be done. Cost, nothing but time, all of the wood came from local building sites, the steel is from the scrape pile, even the plates, they have traveled across country from MA, it was time to use them. OK there was cost, six threaded rods, with nuts and flat washers, sanding belts, and electricity. Once the 2x2-Receiver and Tool Rack are in place I will post more pictures. Looks good. Is that a little Peter Wright? Yes it is a PW but since it is the biggest one I have I don't consider it little at 162 lbs., LoL ! Recently reworked a pin for my tractor, when I hit the pin I was amazed at how quiet the anvil was in response to my hits and I have not even bolted it down yet ! As I hit on the hot pin to make sure it was straight I thought how much time went in to making the stand and it turns out to have been worth it ! It may be wood with steel plates but it is heavy and quiet, far more that expected and I am happy..., that is always a good thing ! 160 lb is a good size for general blacksmithing. I worked in a smithy and "my" anvil was a 80 kg (176 lb) one. Never thought of it to be too small. Anvil size is a bit subjective and of course depends from what you want to forge. If you intend to forge an anchor for a 150' boat ... you will need a bigger one. My first anvil in Australia was a 40kg one. 88 lb ... I made a few hundred meters of railing on that little thing without much thought. A good bolt down, the right hight and a solid stand makes all the difference ... well not to mention the right size hammer. Your stand appears to be very solid and stable. How did you strap the plates to the timber? And have you bolted the anvil down yet? Great job on originality. Form an function are sometime hard to pare. Looks like you were able to do it. It was sort a planned but unplanned shape, that fell together ! The Steel Top and Bottom Plates were actually an after thought and one I feel was the best ! The Wooden shape came from trying to fit the wood I had scrounged in to a shape; first it was a Rectangular Block, then I saw a Stand with an arch in the middle, next I remembered working on my Uncles Anvil and always bending over... Wham-Bam hence the shape, foot room with a good solid core ! Considering the stand started out with scrape construction lumber, I am very happy with it. As it turns out, I had to reform a pin for my Tractor and used the Anvil. Heated the pin with the Torch and Rose Bud Tip and straightened it out, another Wham-Ban... got the tractor fixed. Isn't that what blacksmiths USED to do ? Bingo on the tractor fix. Your stand appears to be very solid and stable. How did you strap the plates to the timber? And have you bolted the anvil down yet? Hey Marc, missed your question on the Stand, it has been a while but I will answer it now ! The top of the Stand was level, maybe a hair off of center but so close I was happy. I drilled and counter bored four holes in the steel plates, allowing the use of 1/2 inch Lag Bolts, and ground the surface of the Plate with 36 grit paper ! I squared the Plate to the Wooden Stand and marked the holes; I then drilled the Stand with a little smaller hole than called out for 1/2 inch Lags, allowing for a better bit. Then I put some Construction Adhesive on the stand and screwed the four bolts in, not all the way, just enough so I could tap the top square to the wood. Tightened and flipped the Stand and repeated the process on the Bottom Plate. The Adhesive was a construction grade adhesive, made for Wood and Steel Joining, spread it over the Stand, using a thick spread of adhesive and hoping it would fill in any dips and cracks, etc. I checked the square of the Plates to the wooden block and tightened the Lags and clamped everything together with four metal Screw Clamps. Scraped the extra adhesive off the edges and hoped for the best. Let it dry for a couple of days allowing any extra adhesive to fully cure. So there you have it, didn't think to add this in the overall build. I far prefer a three legged metal stand, it is always stable, and you can get up close to the anvil. I have the single leg under the horn with the legs angled out about 17 degrees. I plie to have a heavy plate for the top and use an adhesive calk to glue the anvil to the stand. That will deaden the sound and if the stand weighs 100# you have effectively increased the anvil weight by 100#. I stand at the heel of the anvil rather than the side and lean my hip against the heal for more stability and better hammer control. I like the face of the anvil to be at wrist height so that I stand up straight and don't bend my back. At the end of the day you will not have a back ache and will not be as tired. When I started my Anvil Stand my goal was not bending over, as you describe it helps the back out ! I do not know the exact height of my Stand I will need to get is measured up but I think it ended up a little higher than wrist height since I will be doing smaller pieces. 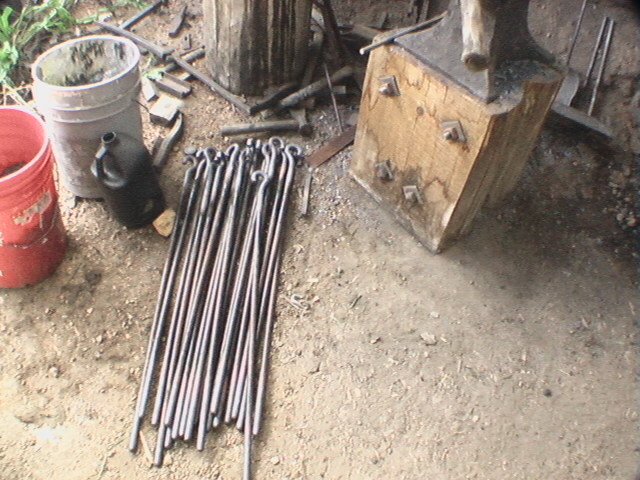 The Stand is solid, once the Anvil was secured down, with some homemade Clamps it is so quite, and the Stand's weight, not even sure of that but I had to use the tractor to move it in the barn, so the Stand with the Anvil... I'm thinking over 200+ lbs. now ! I'm guessing but actual cash outlay was around $20.00, Through-Bolts and Glue, maybe we could add something for electricity use or my labor, oh ya we never recover that ! I like a Metal Stand but two things, my welding isn't as good as my Gluing and Screwing, and the the wood was free... the Steel Plates (top and bottom) were left overs from a project my Uncle did, YEARS back, and I brought them across country with me, free works for me ! I agree. I use 12 degree for the legs, made of thick wall rectangular tubing filled with sand and oil ... and big 5/8 bolts to stop the ringing rather than silicone. Wrist high is good. I disagree only on one concept. The mass of the stand does not add to the mass of the anvil. The stand's function is to hold the weight of the anvil and stop the pesky ringing. The hammer blow sinks in the anvil mass. The stand is different material, different density and separated by an interface and will never become one as much as we try. I just noticed your first pic. 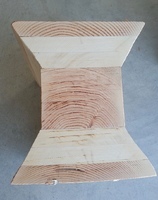 I built a stand from a ponderosa stump with that shape, or close. It was a bit small and the 4 feet hung just off the stump. I made 3 chainsaw cuts and used my alaskan mill for these. The side cuts were the length of the base plus 3" and half the base width plus 3". Basically, i drew the anvil base on the centerline of the log and added 1-1/2" all around and making sure both side cuts were the same size. Then i cut the log in half, rotated each half 180, and matched up the two side cuts. these side cuts became the new centerline. Then i made long bolts out of 1" all thread and forge welded square nuts on for the bolt heads. A few hand made large washers, drilled holes and buried the stump a few feet into the ground. I then notched the stump deep enough to set the anvil in an inch or so of sand. this silenced the ring and made leveling the anvil a snap. the fit between anvil and stump was tight enough that i didnt need any other fasteners. This gave me what I prefer. A wooden stump buried in the ground and a very secure anvil. 10 or so years later i moved. I should have pulled the stump and taken it with me. I did pull the bolts. We all have those days where everything fits but doesn't ! I tried to make the stand as heavy as possible using what I had on hand but still movable. My gas forge is on wheels, so things need to move together, sometimes. Do a write up on your process of building a stand, something for everyone. When I first started the Stand Build, I thought of a stump, and remembered my Uncle had a stump and I never liked not getting as close as I wanted to; so that was out. 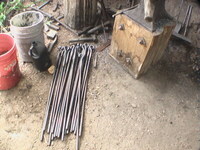 reading on different Blacksmith sites I found steel stand could be a good fit, BUT I found a few pictures and build videos of wooden stands, some I liked some I didn't but it was more like a stump than the steel stands. I two wooden stands that had arches in the center of them, one was made from a 6 x12, things started to click... wood it WOULD be ! I found a few pictures of home made wooden stands, one in particular was made from scrape wood and I had a bunch of construction 2 x 12s so I decided to build my own. I asked a Contractor about short pieces of thicker wood, he came back to me with a 30", 6 x 8, and some good quality 2 x 12s. so the old mind decided then and there the 6 x 8 would be the center core and a stated layering the 2 x 12. I cut the pieces, drilled some holes and drilled a bunch of holes for the all thread and numbered the pieces. I remembered the arched stands but decided to make a foot relief, so I boded things together and drew out some lines, took things apart and cut the pieces with angles. From there things just fell into place and the results are as it ! It was a continuous work in process until the glue got spread and the all-thread got tightened, clamped, and tightened the again. Things fell into place based on the way the wood talked to me and I am happy both in design and in the cost. All of the pieces wood and steel was laying around, the glue and all-thread cost about $20, so the cost was good too ! I am happy the way it turned out, it is heavy, it is unusual, and it has made the PW very quiet. I still need to add the Tool Rack, the should happen soon. en the snow melts. Im putting up a new shop on new home turf. Its already started. Just got a much needed snow year so far. I think your stand is cool! "esthetically pleasing" and does all you need. Cant beat that. Stand setup is pretty situational. Ive been a working smith all my working life. So, The primary tools are permanent and Married to the earth. As a farrier, i built a metal light duty stand for portable. And i still have it and use it as needed. Im putting up a new shop on new home turf. Its already started. Just got a much needed snow year so far. Any pictures of the new shop, always good to see what others are doing ? The stand is what it is, a piece of scrap wood hear a piece there, some scrap steel here and there, as you said it does what I need. I'm new to my own Blacksmith Shop and it is little more than a Decorative Metal Fabricating Shop than Blacksmithing, but the section setup for the Shop is small and I needed something mobile, so my Stand works for me too ! Is this a row a blocks, and then the building ? Not that, that is bd thing, eery where is different but have you thought about pressure treated 4 x 4', Post and Board style of building. I stated a small shop back in MA, it was attached to an existing shed but at a lower lever, and then there was a joint roof added about 2 feet above the old shed. I started that one by digging holes for 4 x 4's, the added the 2 x 4's horizontal to the 4x's, top, bottom, and middle. Bought some left over ship-lapped rough pine boards and started siding; build a door from the same stuff, wasn't too bad for a non-carpenter. I'm sitting g o what's called mancos shale. It's a good base as long as it is kept away from air. It will then decompose to a fine powder. So I dug a footer and filled it with 3/4" roadbase. I'm hoping this will prevent it from decomposition. Then winter set in. Next I'll dig some 8" or so holes for sauna tube, 4 to a side and pour some concrete piers with rebar. I'll anchor my building to these. The building is 18'x20'. I'll start a thread in the shop building place and add some pics. This will be a permanent building, but, hopefully a temp shop. I've had one other attempt at my "dream shop". Hopefully, my second attempt will be here. If not, I have a new shop. Good luck with that, do it right the first time, well maybe the second time ! LoL ! It always take more time that people plan to get it done. I found a pic of my anvil stand above. air\word pictures are hard. This should prolly go elsewhere, but decided to put it here. Ill do a how to when i set my anvil in the new shop. On the other end of the all thread i forge welded a square nut. The anvil sits tight in the inset, the sand keeps it about as quiet as anything else, and the "table"\apron area is good for small tools. It could be bigger, depending on taste. This was my first temporary shop on my "journey" that brought me to here. And the smallest shop ive ever had.